An East Bay man was an unlikely hero last week when he jumped into action to take on a mob of teenagers who robbed a woman on a BART train. The group of teens targeted a woman on a train in Oakland on Friday, stealing her cellphone then running away. Little did they know 62-year-old Leonard Brown also was on board and saw the entire incident. "She was very frantic, very upset," Brown said about the woman. "I screamed out, 'Hey, give me the phone back!'" Brown, a trained security officer with licenses to carry guns, pepper spray and a baton, said his instincts took over, and he chased the teens onto the platform. After a violent struggle, during which he was beaten by multiple people, he managed to retrieve the woman's smartphone. "I felt blows to the head," Brown said. "I was kicked and punched. Some of the kids, his associates, were trying to free him from my grip." Brown once disarmed a man robbing a student at gunpoint on a Philadelphia train. "Nobody has a right to take a life or make a person fear for their life," he said. On Thursday, Brown had a message for the teens. "You never know where I might be, or someone like me, so don't try it," he said. In April, a large mob of juveniles stormed a train in Oakland and committed multiple robberies and assaults. 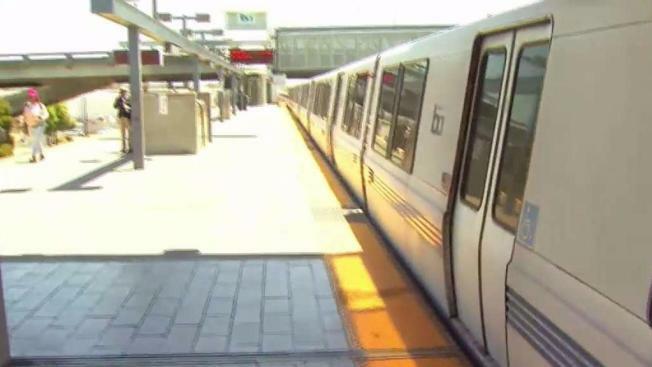 BART has since increased security measures, including installing working surveillance cameras on all trains and stepping up BART police patrols.